Derrick Kortvejesi is the Service Manager at the Century Cycles store in Peninsula, and is one of our longest-tenured team members. Like many local cyclists, he enjoyes riding the Ohio & Erie Canal Towpath Trail, mainly the portion that runs through Summit County. The trail passes less than a mile from Derrick's house, so it's easy and convenient for him to get to. 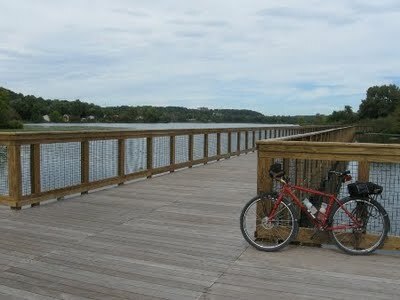 The Towpath Trail runs through four counties (Cuyahoga, Summit, Stark, and Tuscarawas), but the Summit County section is notable in that as of 2012, it is the first county to have the Towpath Trail completed the entire length of the county, with 22.4 total miles of trail. 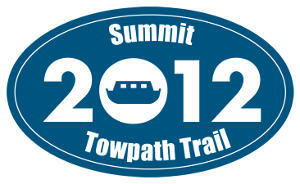 The Ohio & Erieway Canalway Association celebrates this milestone with events throughout the year. The northern end of the Towpath Trail in Summit County begins at the county line just south of the Alexander Road underpass. Much of this section of trail passes through the beautiful Cuyhoga Valley National Park (Ohio's only National Park), where you'll see wildlife such as deer, bald eagles, coyote, and turtles basking in the sun on fallen logs in the canal. Most of the trail surface here is hard packed crushed limestone. Traveling south into downtown Akron, the Towpath follows three city blocks before re-joining dedicated trail. The route is clearly marked with signs; you can ride on the sidewalk, or on the street; whichever you are more comfortable with. Much of the trail near the city is paved. Just south of the main downtown business district, the newest section of the trail passes through former industrial sites, and then Canal Park, featuring many neighborhood amenities in addition to the trail, such as playgrounds and tennis courts. Just further south is possibly the most memorable feature of the Towpath Trail, both from an engineering standpoint and for the pleasurable and unique riding experience. Here, the trail passes over several floating wooden bridges that were constructed upon Summit Lake. The trail continues south through the city of Barberton, through secluded wooded areas and more reclaimed industrial lands. The Towpath Trail enters Stark County just south of the village of Clinton.